Easing your mind and muscles could ease chronic pain. 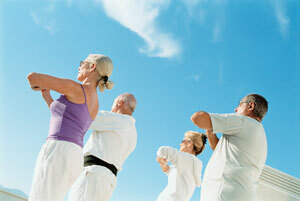 A new study demonstrates that tai chi can significantly relieve fibromyalgia symptoms. Although previous research has pointed to the benefits of tai chi for fibromyalgia, few studies have tested whether regular tai chi can create lasting results. To asses the long-term effects of tai chi, researchers enrolled 32 women with fibromyalgia into a six-month tai chi program that included three weekly sessions of tai chi. Patients experienced significant improvements in their pain threshold, balance, strength, and functional capacity. They also had reduced fatigue, anxiety, and depression. The efficacy of tai for fibromyalgia was also confirmed by a new literature review. After reviewing twenty years of research on the subject, the author concluded that tai chi does not improve headache or rheumatoid arthritis but can help with osteoarthritis, low-back pain, and fibromyalgia. Peng PW, Tai Chi and Chronic Pain. Regional Anesthesia and Pain Medicine 2012; doi: 10.1097/AAP.0b013e31824f6629. Romero-Zurita, A, et al. Effectiveness of a Tai-Chi Training and Detraining on Functional Capacity, Symptomatology and Psychological Outcomes in Women with Fibromyalgia. Evidence Based Complementary Alternative Medicine 2012. doid 10.1155/2012/614196. Written by: Michael Melton on June 19, 2012.Modified on March 24, 2015.